A wide-mouth strip quickly attracts and absorbs a tiny blood drop, helping 97% of testers fill on the very first try, so you can avoid painful retesting.1 In addition, the system has 198 automatic checks to help detect and prevent unreliable results. 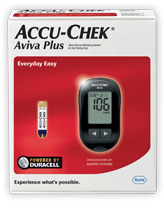 The ACCU-CHEK Multiclix lancet device is proven least painful among leading lancet devices. It uses a pre-loaded six-lancet drum, saving you time and the need to see or handle individual lancets. Accurate results appear in 5 seconds. Contoured, ergonomic design with easy-to-hold rubber grips. 7, 14, & 30-day averages. You can download test results to your PC with ACCU-CHEK Compass software or the Diabetes Assistant® program, our online log. For help with your product, please call the Accu-Chek Customer Care Service Center at 1-800-858-8072. Support for meters is 24 hours a day, 7 days a week. Software support is available Monday-Friday, 8 a.m.-10 p.m. EST. Not a great deal of experience, but I really like the Aviva meter. This meter is great! I am usually opposed to using something new, but my sugar readings appear in no time at all and very, very little blood is needed. You just hold your finger with blood next to the stick and it is wicked onto the test strip. The lancet device that comes with it is amazing. You use a small drum and the device gives you 6 tests...in my case two days. You don't have to handle a lancet and changing the drum is simple. Now testing my blood sugar is quick and easy. Try this and I think you'll like this meter also. This was the meter my diabetes class instructor recommended. The pen lancet has adjustible tension---a new lancet on 2 is barely felt. The lancet is tiny and doesn't hurt like others. Reliable; kit easy to travel with. I really like it. Have gotten some other one that is a mini, but don't like the lancets as well--they reall hurt on pricking. Lancets do not hurt at all. The multiclick drum for the needles is great and I change the drum every two to three days since it holds 6 needles. This is a much better system than the Freestyle lite system I was using. I liked the free style but this is a better system. The used needles are stored in their own drum and you never see them. Also it pain free most of the time and since the needles are in their own drum they can be tossed in the trash. No need to carry used needles around until you get near a sharps container. It only takes a few seconds to get the reading. How ever it doesn't work well in cold temperatures. Which isn't a problem if you know that in advance.